Syrian refugees protest outside the YMCA in Saint John, New Brunswick on December 8. The sight of five young men, all government-sponsored Syrian refugees, protesting outside the YMCA in Saint John, New Brunswick illustrated everything that is wrong about our policy of multiculturalism. Despite being in Canada for two years, the protesting refugees claimed they still could not express themselves in English. 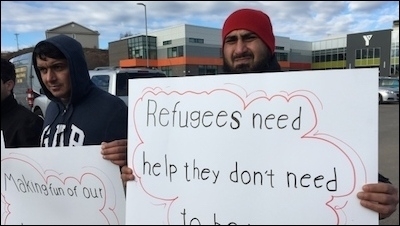 However, one look at their protest signs — unless they were written for them, which raises other issues — indicated they knew sufficient English to write that "refugees need help they don't need to be put down." Another protester held a sign playing the victim card: "(Stop) Making fun of our religious beliefs." Responding to the protest, the YMCA's Angelique Simpson told CBC that finding Arabic speakers for interpreting services continues to be a challenge. But that didn't satisfy the Syrian protesters. One of them, speaking through an interpreter, shared a story about a Syrian woman who was upset that a male interpreter was made to sit with her. What happened next should infuriate every Canadian. According to the CBC report, the woman insisted that without her hijab, she couldn't be alone with the male interpreter. And yet such attitudes have official sanction across the country. 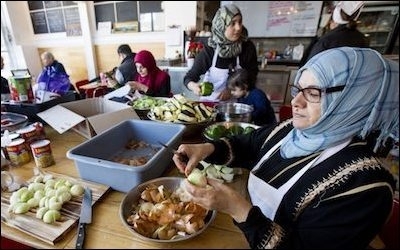 A government-funded kitchen for Syrian refugee women in Toronto. A story in the Toronto Star reported on a government-funded kitchen for Syrian refugee women that, in the words of one of them, "brings me back to Syria." Instead of helping these women find work among the thousands of Canadian restaurants and fast-food outlets where they would mesh with Canadians and understand the culture, we are making investments so Syrian refugees can mentally remain in Syria. Contrast those examples with the experiences of two refugees from Balochistan, who have embraced Canada and assimilated into the fabric of the True North. Just about the time in 2014-2015 when the Syrian refugees arrived in Canada, I was involved in arranging refuge in Canada for a young man and woman fleeing for their lives to escape the Pakistan army in Balochistan. Refugees must embrace Canada and assimilate into the fabric of the True North. Both Baloch refugees spoke no English when they arrived at Pearson Airport. When I asked Lateef Johar whether he wanted to make a phone call home to his mom to let her know about his safe escape, he burst into laughter. In broken Urdu (Balochi is the only language he spoke fluently at the time) he said: "Phone? My village does not even have electricity, not even a road." He had escaped hidden in a truckload of onions for 16 hours before he was finally able to outwit his pursuers. The other Baloch was a young woman, Karima Baloch, who also spoke no English. I was her interpreter when she met MP Bill Blair as one of his constituents. At that time, she did not speak a single word of English. Fast forward to 2017. Lateef Johar now speaks fluent English, has completed Grade 12 at night school and will soon be a student at York University. He tweets in English and has also tried his hand at poetry. Karima Baloch recently spoke at a community event in flawless English, leaving her audience and myself pleasantly shocked. Why could Baloch refugees assimilate on their own while the Syrians couldn't? As the "uncle" of these two Baloch refugees, I had set three rules for them. 1. No ethnic radio or TV in your home. 2. Listen to Metro Morning on CBC and light rock on 97.3FM and 98.1FM. 3. Read a daily newspaper. My plan worked. The government's didn't.